Frank Mountain threw the second and final no-hitter in Columbus Buckeyes history, 133 years ago today. 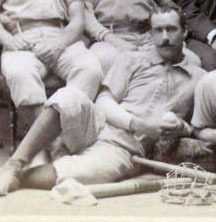 Mountain, on June 5, 1884, no-hit the Washington Nationals of the American Association for a 12-0 win on the Capitol Grounds. Just a week earlier, teammate Ed Morris no-hit the Pittsburgh Alleghenys (Pirates) for a 5-0 win at Pittsburgh’s Recreation Park.